The Obama administration has opened up a new front in its war on America's eagles. For years, the president has relied on wind turbines to orchestrate his eco-genocide. Biologists estimate that wind farms kill as many as 328,000 birds each year by chopping them out of the sky. 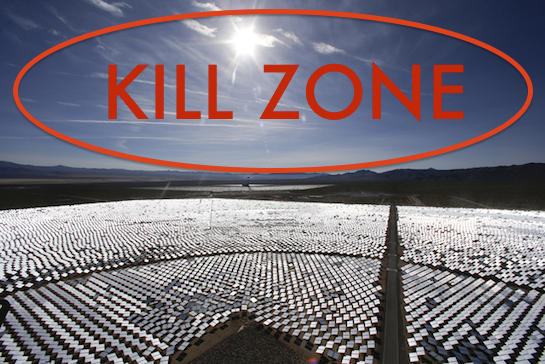 The administration's successful weaponization of solar farms will only accelerate the death rate. Studies indicate that the Ivanpah Solar Electric Generating System in California has proved to be an especially efficient apparatus for eagle extermination. The facility, which was financed in part by a $1.6 billion taxpayer-backed loan from the Department of Energy, has been incinerating innocent birds with heat lasers created by its massive array of 350,000 garage door-sized mirrors. First, insects are drawn to the reflective light of the solar mirrors. That draws small, insect-eating birds, which in turn draw larger predatory birds. The rays of the mirrors' reflected light produces temperatures from 800 degrees to 1,000 degrees Fahrenheit. Any animal caught in the intense glare of the mirror's rays may catch fire and plummet toward the ground, or spontaneously combust altogether. Bloomberg notes that the birds are either "incinerated in flight; their feathers are singed, causing them to fall to their deaths; or they are too injured to fly and are killed on the ground by predators." Birds that ignite after passing into the Ivanpah kill zone are known as "streamers." 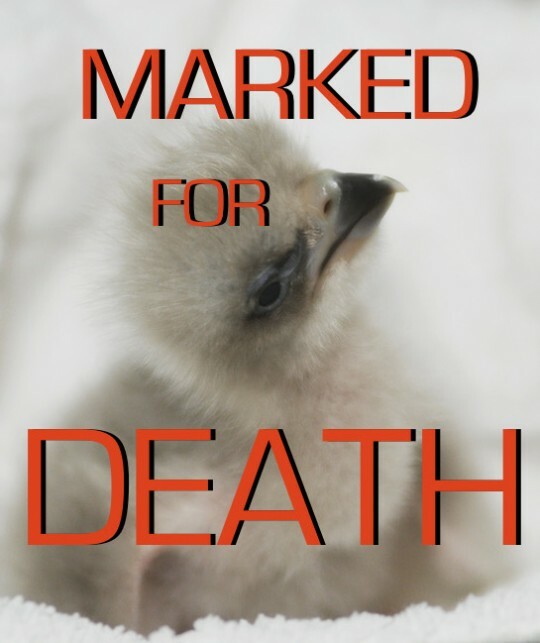 Reports estimate that 141 birds have died at the Ivanpah facility, which opened in February. 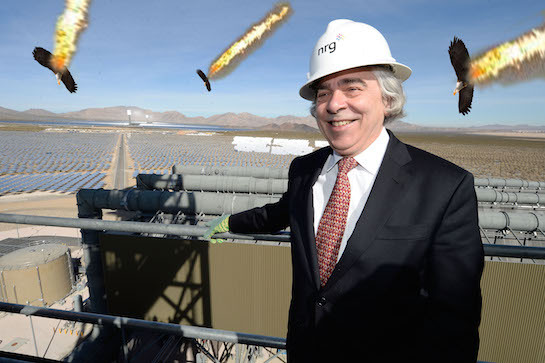 Energy secretary and hair icon Ernest Moniz attended the opening ceremony at Ivanpah, but kept getting photo-bombed by dying eagles. This entry was posted in Issues and tagged Barack Obama, Climate Change, Green Energy, Obama Administration, Solar Energy. Bookmark the permalink.